A New Mac Tip Every Day: Load "pages that load in a new window" in a new tab! Load "pages that load in a new window" in a new tab! This probably exists in other browsers, but I know about it and use it in Camino. Some websites have links that open in a new window by default. Even if you have tabs enabled, it won't open in a new tab. There is a feature in Camino that can change this however. 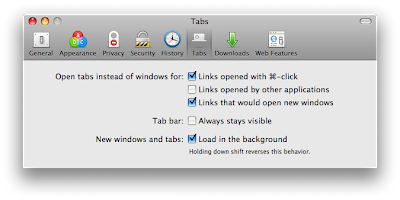 It is "Open tabs instead of windows for" "Links that would open new windows" in the "Tabs" tab of Camino's preferences. i never really got to like camino. it's nice and integrates well into the mac os but it's not widely supported. also, i'm partial to firefox because of its add-block plus add-on. and with skins that make it look like safari, there's no reason not to use it! i have a build that messed with the buttons and made them look more mac-like, nicer than what the alpha version of FF3 looked like anyway. everything that opens in a new window opens in a new tab in FF by default i think, and if you click shift while opening a new link it'll open in a new window, and command will open it in a new tab. How can you change this in Safari? press enter and you're done. *Note* when in terminal keep in mind there is a space AFTER "Safari" in both don't forget to enter this space. You even don't really need to get into the Terminal to make Safari open links in Tabs instead of new windows. Just get SafariStand and check in the General settings "Open Target Links in New Tabs". Thanks - I've been looking for a means of fixing the "popups in new windows" problem, and this does what is required. I use Camino as my main browser for two reasons: i've used ff and safari with tabbed browsing enabled, but Camino is the only one that opens new windows as a tab consistently. Also, Camino is the only browser that lets the user dump downloaded files directly through the download window. REALLY helpful when downloading multiple pdfs. Thanks!!! My Safari works great now. Controlling the minimum speed of fans! Previews on the iTunes store! Photobooth export to Flickr and YouTube! DVD Player on top of other windows! Volume adjustments without the sound! Creating a template of any document!